While it's true that I don't eat a lot of Italian cuisine, it's also true that I'd absolutely love to visit Italy one day. Pizza's was an Italian creation originally, right? I know we've Americanized it to no end, and this is a perfect example of that--baked beans, ham, and lots o' mozzo. Not a tomater in sight. It doesn't look like that'll be happening any time soon, but while I wait for some lephrechauns to bring me a pot of gold (yes, Ireland's a nation I'd love to experience as well)(also, Scotland and Australia, to name a couple more...), I'll have to settle for eating food conceptualized there and wearing clothes inspired by its atmosphere. That little preface brings me to my giveaway. Have you heard of Shabby Apple? It's a really exciting company which makes it a point to offer stylish dresses that allow you to look fabulous without having to compromise anything else. They're also committed to helping women in many nations and are supporting the fight against global poverty by partnering with Unitus, which is a non-profit organization that accelerates access to life-changing financial services for those at the bottom of the economic pyramid. Shabby Apple donates 5% of its net sales to support work in India (where Shabby Apple Dresses has sourced many of its dresses and the textiles used to manufacture its dresses). Every $100 donation from Shabby Apple Dresses provides at least 20 women with access to financial services and the chance to live a life without poverty. To win your pick of these dresses, leave a comment telling me either a place you'd like to visit or the best place you've ever been (even if it's that spaceship into which you were abducted or Grandma's house right down the street). For an extra entry, like Shabby Apple on Facebook, but be sure to let me know that you did so in another comment. I'll close the comments in a week, on May 30th, and I'll contact the winner shortly thereafter. Leave an email address so I can contact you, and good luck! The giveaway is only open to US residents--sorry, all you Italians (and Irish and Scottish and Australians)! I think you'll all find the Shabby Apple company a dream with which to work and shop! Does this mean you are going to do a pizza dough recipe? Also,I love that grey dress! The place I most want to go at the moment is the New English coast. Husband and I want to fly to NY, hire a car and drive through, staying at wee B&Bs. Oh, those dressed are so glamorous! Best place ever? Santorini, Greece. Hands down. But I've always wanted to go to Italy, too. I love Shabby Apple's dresses! 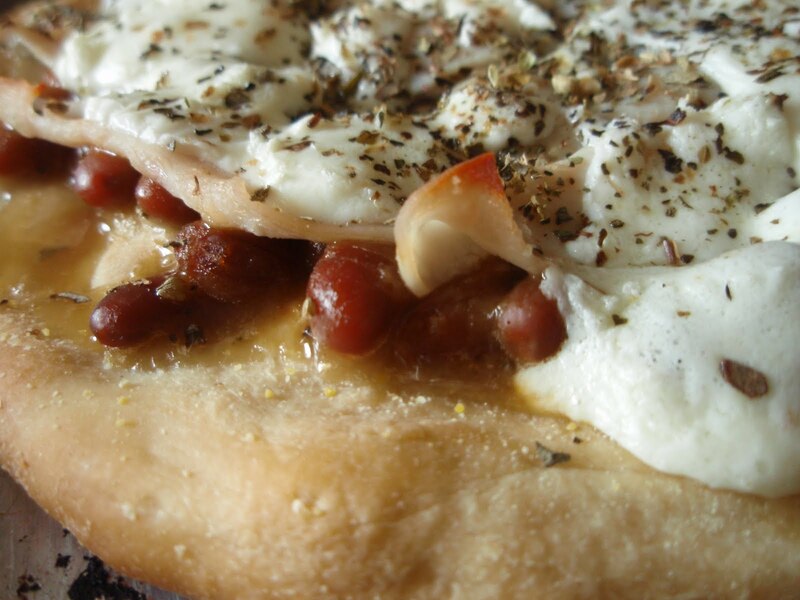 But i also love the idea of baked beans on pizza! Shucks, this is one Australian who's not eligible. I would have loved that red dress. Good luck everyone else :) And I have never thought of baked beans on pizza, but it'd be great for brekkie! (Aussie term = breakfast). The best place I've ever been was Washington DC! So many sights to see! I love it! I think Greece wins first place for me. It was gorgeous. But I'd love to go to France and England. Why aren't transporters a la Star Trek real??? Italy is next on my list! The best place I've ever been was a one-week stay in an overwater bungalow in Tahiti. It was my honeymoon, and it was perfect... beautiful, and being with my love was amazing. One these dresses are so cute! And Paris was my favorite vacation if it wasn't for all the walking I think I would have gained 10 lbs from all of the Nutella crepes I ate! The pizza looks terrific! Those dresses are so pretty. GOod luck to all! There are lots of places I'd like to go, but so far the best place I've been was Jamaica for my honeymoon. Amazing! I have been almost nowhere, so I would really like to visit anywhere new! But probably mostly somewhere warm and tropical or Europe. Oh, and I "Like" Shabby Apple on Facebook. La pizza está muy buena con ingredientes muy ricos y original con las habas,me encantó,cariños y abrazos. The best place that I have ever been is Santorini, Greece. I loved it so much that I went 3 times, and I long to go back again soon. I would love to win a Shabby Apple Dress and wear it there...! There are so many places I'd love to go! Australia and New Zealand are at the top of my list. Gorgeous dresses and what a great cause! I am actually going Italy and Paris for a few weeks next summer! That Da Vinci dress is great. So, far my favorite place to visit has been Amsterdam. I'm actually heading back there on Saturday & then off to Stockholm. I would love to go to Tahiti, or anywhere else in the South Pacific. I loved St. Lucia and can't wait to go back! I haven't traveled much, but for our 10 year anniversary last year we went to Acadia National Park in Maine and it was absolutely beautiful. We've moving to CA in a few weeks so my traveling will finally be expanded a bit! My Husband wants to go to Australia and I keep telling him the can just drop me off in Fiji on the way, but truely anywhere warm with sand and water will do. During college, I had the joy of working in Yosemite National Park for 3 summers. Waking up to that breathtaking beauty day after day was amazing. The more I explored the valley and high country, the more I appreciated it. Climbing a waterfall before my work shift each day was a dream! I would love to visit Paris. I know it may sound a bit cheesy, but I've never been outside the US and would like to go sometime during the Tour de France to experience their biking culture and eat a lot of good food! I can't pick just one place to visit! I'd love to go to India, Japan and Morrocco to relish in their amazing cuisines! I loved Paris and Portland, Oregon! I would really like to go to Singapore next. I'm a plain, simple person. For my money, you can't beat Myrtle Beach, SC: clean, wide beaches, hotels in a variety of prices, and within driving range of half the country. Flying nowadays is such a hassle that I don't know if I'll ever board an airplane again. I went to El Salvador with Habitat for Humanity a few years ago, and it was a gorgeous and stunning country. The food was amazing (before I got sick and pretty much couldn't keep anything down), and the people were so sweet and caring. That plus ocean, beaches, mountains and volcanoes? It can't be beat. Love the gray dress!I want to go to Italy!!!! Oh well, I am not thin enough for those dresses anyhoo. From Canada so don't count me in but enjoyed learning about this. Since I couldn't win my own Shabby Apple giveaway, I hope to win yours! I'd really love to visit Portland, OR this summer. I'd really like to visit Australia/New Zealand/Japan (since they are over in the same chunk of world I'm grouping them together) or the Mediterranean. That's a lot of answers but I'd like to go to a lot of places! I'd love to go to Australia, Ireland or England, or lots of other places too. This is a terrific giveaway and the company sounds wonderful! I'd also love to visit Italy - it was actually in the works for this summer, but we changed to Hawaii and California instead. Maybe one day! I would love to go to Morocco or Turkey...for the food. Oh. The. Food. Those dresses are gorgeous! I would love to visit Australia to see the Great Barrier Reef! Thanks for this awesome giveaway...these dresses are amazing!! OMG..seriously, I just stalked their site. I want EVERY SINGLE DRESS. I love the fact that they show you the dresses by body type. That is AWESOME. I need like 20 of their dresses. Ohhh, if I only had the $! I am totally digging that red Maxi dress! Just liked Shabby Apple On Facebook! I'm absolutely crazy about all three of the dresses. Love them. I would love to visit Italy someday. It's definitely on my bucket list. Cinque Terre in Italy! It looks so breathtaking in photos. *Sigh*! The best place I have ever been is Paris, France! Everything there is gorgeous! i follow shabby on FB too :) thanks!! I have to repeat your destination of choice. I've always wanted to visit Italy, and I have a feeling I won't want to leave once I get there! I have always wanted to go to Istanbul! Ooh, I would love to visit Ireland or Scotland but my first choice would be New Zealand. And these dresses are so cute! Thanks for the change to win. I don't think there is enough space to list all of the place I'd love to visit!! But yes, Italy is on the list!! I'm planning a 10 year anniversary vacation to Hawaii! Never been, but I have a feeling one of these dresses would be perfect! I'm a facebook Shabby Apple fan! I lived in China for a while and LOVE It! Favorite place i've been. And love shabby apples dresses. Dying to have one. I am a big follower on facebook! I love Shabby Apple dresses! My favorite place to visit is probably Florence, Italy. i would love to go to Italy, to see where my family is from. I would love to go to Italy with my husband. I know that he's always wanted to go and I'd love see it with him. I would love to visit Italy, honestly to even get away for the weekend would be nice with my hubby. loving that pizza and the red dress is awesome! Wait... where is the pizza recipe - that photo has me drooling. The dresses are really cute! Italy,Ireland, Scotland, and Australia are on my wish list too. I went to beautiful Australia about 20 years ago and will never forget a single detail! Hehehe, I was looking for apples on your pizza at first! Looks like a great company. Well, since I rarely venture out of my booming metropolis, Soddy Daisy, I have lots on my wish list. But I would have to say Paris tops the list. Just because. Best place so far is Fiji! I'd love to go to Ireland. I would love to go to New Zealand!! However there are so many places to see here in the U.S.
i just "liked" shabby apple on fbook!! The best place I had been to is my mom's ancestral home which has sadly been demolished. Now there is a multi story building in it's place. The house had an open courtyard in the center where my cousin's and i spent countless hours playing under the gorgeous summer sun. I still get dreams about the house. The place I would love to visit is Cambodia...would love to see Angkor Wat. I like Shabby Apple on Facebook as Jo Sue. I'm not eligible for this contest, but WOW - I hadn't heard of Shabby Apple and I have now got 4 dresses in my sights. I will narrow it down to 2 though. Such beautiful clothes and such an admirable country. At the moment I don't care where I go but I want a bungalow over a lagoon and a swim-up bar with really good cocktails. exquisita rece muy bien elaborada me encanta se ve muy linda,cariños y abrazos. What adorable dresses! My favorite place ever was Chiangmai Mai in northern Thailand, it had so many interesting shopping bazaars and temples, delicious food and the people were friendly. Admirable country? WTF? I meant admirable company.